Thanks to the guys behind browser based zombie-survival game Die2Nite we have 10 beta access keys to giveaway to some lucky readers. Die2Nite comes from French web game developers Motion-Twin and is a fun little survivalist game. Competition closed, congratulations to those lucky people. New giveaway here. It is competition time once again here on The Reticule and this time you can win not just one, but two games! It is all part of the efforts of Wolfire and Unknown Worlds, (the developers behind Overgrowth and Natural Selection 2) who have launched a special deal where you can get both games for the price of just one. You can get more details here or watch this video for more details. We have three bundles to give away to three people who email us via this link with how you think humans may evolve by 3010. They can be serious, funny or even inspired by Overgrowth or Natural Selection! The contest closes at 14:00 GMT on Friday 8th January and the usual rules apply. What’s that Lassie? 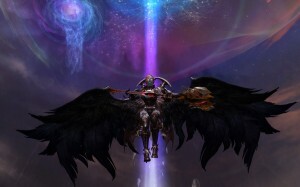 We have 15 Aion EU beta keys to give away? To the first fifteen people who email us via this link? And they should hurry as it’s first come first served and they expire on the 13th? But we’ll be updating this post when they’ve all gone? And that there’s far too many questions in this blog post? No, we don’t care about some kid trapped down the well. We’re busy downloading the client. GO! The standalone expansion for Red Alert 3 is just around the corner, Uprising is released on the 12th March and we have three download codes for the game. Uprising is a standalone expansion so you don’t need Red Alert 3 to play the game. If you want to be in with a chance of wining this prize then send an email to the competition address by the 15th of March 2009 containing a haiku told from a Red Alert 3 Bear’s perspective. If you don’t know what a Haiku is, check out the Wikipedia entry on it. If you don’t know what a Red Alert 3 Bear is then this is the page for you. Competition rules and entry by email only please.